New research has shown that the language you speak affects the moral choices you make. Recently, EurekAlert informed its readers about a very interesting study conducted by psychologists from the University of Chicago and the Pompeu Fabra University in Barcelona. According to their research, language influences the moral choices people make. In their studies, they found that people who speak a foreign language approach moral dilemmas in a more utilitarian way than when they speak their mother tongue. Boaz Keysar, Professor of Psychology at University of Chicago, believes the outcome of the study has significant consequences. After all, he says, in today’s globalized society, moral judgements are made in both native and foreign languages immigrants, for example, can be asked to take part in jury trials that are held in the language of the country they live in. In addition, leading author Albert Costa states that the study’s results can be used to predict or explain deliberations in for example the United Nations or the European Union. According to the researchers, EurekAlert says, speaking a foreign language reduces emotional response, which results in a psychological distance from emotional concerns when making moral decisions. The researches came to this conclusion after two experiments. 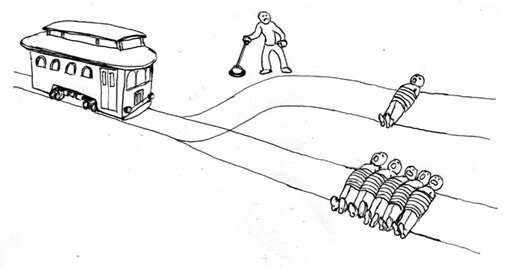 For both of these experiments, the “trolley dilemma” was used to find out whether the hypothesis that people are more likely to take a utilitarian approach to moral choices when these are posed in a foreign language was true. In the first experiment, participants were asked to deal with the “footbridge” scenario belonging to the trolley dilemma. People were asked to imagine themselves standing on a footbridge overlooking a train track. Then, they had to visualise that an approaching train was on the brink of killing five people, which can be stopped if they pushed somebody off the footbridge. EurekAlert says this meant participants had to choose between actively sacrificing one person to save five others, or remain inactive and see five people die. The researchers found that more participants, who came from France, Spain, the U.S, Israel and Korea, chose to kill one person in order to save five – the utilitarian option – when the dilemma was presented to them in a foreign language. According to Costa, people were still twice as likely to choose this option when the languages groups were randomized. In the second experiment, EurekAlert says, the dilemma was made a little less emotional. Here the participants were presented with the following: there is a trolley headed towards five men, but if the participants wanted to, they could switch the trolley to another track where it would only kill one. Here, people were more willing to deliberately kill one person to save five. Whether they were presented the dilemma in their own or in a foreign language, eighty per cent chose the utilitarian option. UChicago doctoral student in psychology Sayuri Hayakawa adds that the way people learn a language can be used to explain the results. Foreign languages are learned in a less emotional setting than native ones, i.e. a classroom, and take extra effort. Moreover, she believes translation often leads to a loss of emotional content. Costa believes the results of the study show that moral judgements are influenced by the language people speak. Thus, he thinks it is vital that people are aware of this impact in order to make more informed choices.